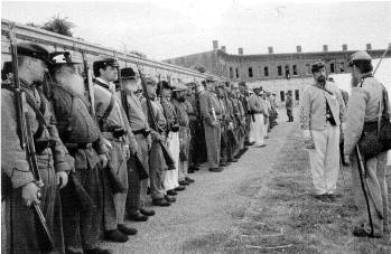 The Liberty Greys at Ft. Adams, 2000. Announcing the debut of the Drill Network Forums, a place for discussion about matters of drill. Look there for further announcements about this site. Note the link on the left for Casey's tactics, provided by the kindness of Scott Gutzke of the 64th Illinois. Use this console to stop the music! The fife music you hear is paced to the quick time march of 110 steps per minute. Using it to practice, be sure to measure off the 28 inch step.